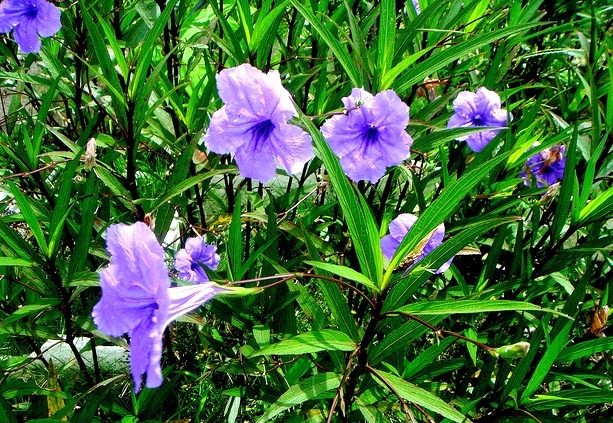 Ruellia is a small genus of flowering shrubs from warm and humid climates of South America and Mexico. The most popular plant from this genus is Ruellia brittoniana which is usually grown as perennial shrub. It is quite fast-growing and sometimes self-seeding shrub that grows up to 3 feet. The lance-shaped leaves are dark green, and flowers are purple, violet or showy blue though some varieties do bear white or pink flowers. These lovely flowers do not last more than a day but they are quite attractive and have prolific growth in spring. Flowers of Ruellia brittoniana have close resemblance with those of Petunia, that is why, it is also known as Mexican Petunia or sometimes as Wild Petunia. Mexican Petunia is quite easy to grow from seeds as well as cuttings. It requires moist but well-drained and fertile soil. It also prefers sunny exposures which encourage growth of flowers – plant in sunny location would flower profusely whereas plants that do not receive direct or bright sunlight often bloom frugally. The best way to use Mexican Petunia or Ruellia brittoniana is growing it as border plant or as background plant in landscape designs. A few dwarf varieties of Ruellia brittoniana are also available; they make good container plants for indoor locations where they receive bright sunlight. Generally, Ruellia brittoniana should be protected from frost and freeze.